A new strike team of police officers will be helping to keep our roads safer as Sussex Police announced a wave of drink and drug-driving checks across the county. Sussex Police Chief Constable Giles York has commissioned a new team of special constables, which will tackle road deaths and make the county’s road network safer. The group is called the Operation Crackdown: Strike Team, and will be the law-enforcement arm of Operation Crackdown, which is the way the public reports antisocial driving to police. Last year in Sussex, 55 people were killed in a collision on our roads. Chief Constable York said: “I am delighted to announce the implementation of this team to Sussex. Working in partnership with county agencies, our aim here is to reduce those who are being killed or seriously injured (KSI) on our roads, educate the drivers using our highways to the benefits of road safety, and enforce the law on road users who continually think it is okay to flout the law. The first job of the strike team will be to complete drink and drug-driving checks. 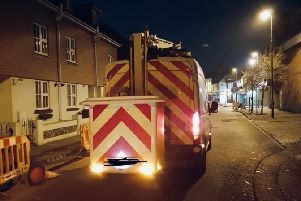 These will take place at various locations including Brighton, Worthing, Lewes and Chichester throughout June, and will be publicised through the news and social media. The team will carry out extra training in the autumn, including fast roads training, evidential breath test machines, drug wipes and vehicle examination.